Also known as John Mark (Acts 12:12), he was one of the Seventy Apostles. He was born in Jerusalem. The house of his mother, Mary, adjoined the Garden of Gethsemane and became a place of Christian gathering and lodging. St. Mark was a very close companion of the Apostles Peter and Paul. 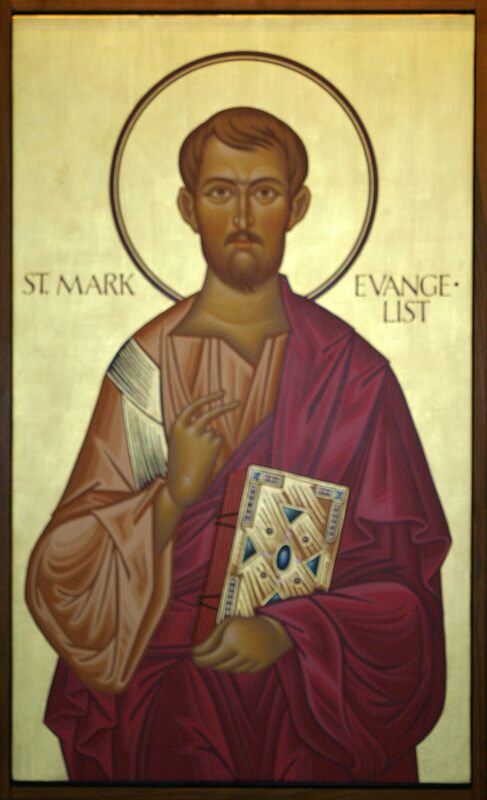 When the Apostle Paul came to Rome in chains, St. Mark went there and wrote his holy Gospel (ca.62-63). While traveling and preaching the Gospel, St. Mark was inspired to go again to Alexandria and confront the pagans and converted many of them, but some of the pagans seized St. Mark while he was serving Liturgy. They beat him, dragged him through the streets and threw him in prison. There St. Mark was granted the vision of the Lord Jesus Christ. St. Mark died as the crowd dragged him to the courtroom. His last words were, “Into Your hands, O Lord, I commend my spirit.” When the pagans wanted to burn St. Mark’s body, everything grew dark, thunder crashed and there was an earthquake. The pagans fled in terror and Christians took up the body of St. Mark and buried it in a stone crypt. This was April 4, 63. The Church celebrates St. Mark’s memory every year on April 25.